I talked about my wrist hurting in one of my earlier posts which prompted me to check out and buy several keyboards, mice, and trackballs with the hopes that one of them might alleviate the pain once and for all! Ordered from Amazon last December. 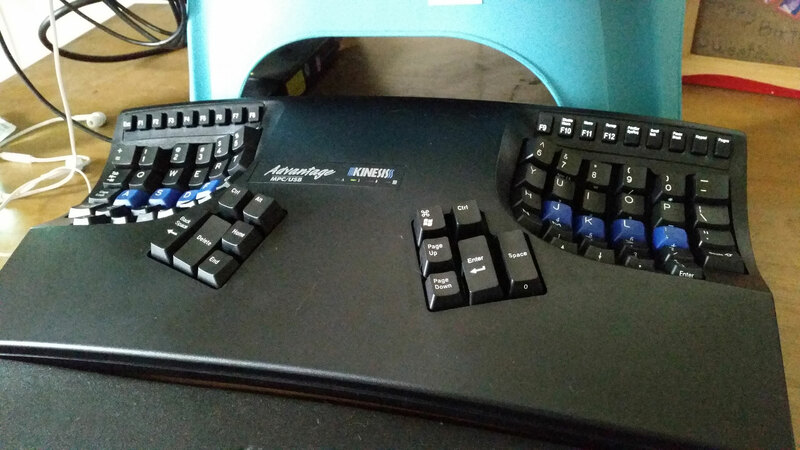 First up for review is the Kinesis Advantage Ergonomic Keyboard. I will update this post as I get more acquainted with this keyboard but, for now, here’s a first use review. Sorry for the crappy audio! I’m saving up for a good quality microphone and soundcard but this would do for now. Like what any good Geekysaur would do, I compared my typing speed on my Razer Blackwidow Ultimate Mechanical Gaming Keyboard with that on the Kinesis Advantage. I average around 120WPM on a normal QWERTY keyboard and did 102WPM on my first run on the Blackwidow. Switching to the Kinesis Advantage, I did 25WPM on the first try. Note that this was the first time ever that I used the Kinesis Advantage and it feels like it really takes a lot of getting used to. The Kinesis Advantage feels plasticky and the function keys are rubbery. I expected more from a USD 269 keyboard with regards to the build quality but it’s not a dealbreaker. The concave “letter wells” will force you to use the right fingers for hitting keys which really takes a lot of getting used to especially for people like me who have big hands and have already developed the habit of reaching further to hit certain letters. I’m used to using either thumb for hitting the Spacebar so the placement of the Backspace on the left thumb and the Space on the right was disorienting at first. I also use a lot of keyboard shortcuts so the placement of the Ctrl and Alt keys irritates me a lot. Hopefully I will find a more natural way of hitting those two keys as time goes. To be honest, I got used to the Blackwidow’s Green Switches so I felt that the Kinesis Advantage’s Cherry MX Brown Switches lack the tactile feedback and sound that I’ve already grown to love. I’ll update this post when I get the hang of this new keyboard. What do you think guys? Have you had experience with the Kinesis Advantage keyboard? What’s the fastest you think I can type on this thing? Leave your comments below!